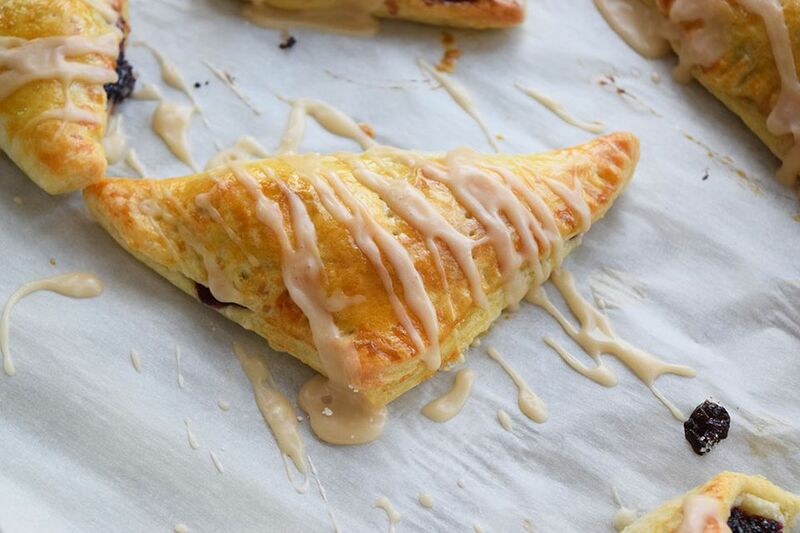 These cherry turnovers melt in your mouth! This recipe can't really get any easier, you can use pre-made puff pastry and canned cherry pie filling. Of course you could get really crazy and try making the puff pastry and the cherry pie filling from scratch. But, for those less ambitious days, this recipe is super simple and tastes like it's totally made from scratch. You could also make these pastries open faced, like my blueberry cream cheese danish recipe. It's an even simpler twist on the classic pastry. These are perfect for making ahead of time. They reheat nicely in the oven. Just pop them in an oven set to 400 F for about 5 minutes, and you've got beautiful, warm pastries. They are also great for breakfast on the go. They are handheld and compact, so you can grab them as you are headed out the door in the morning. Thaw the puff pastry to room temperature. Make sure it stays somewhat moist. If it gets too dry it will be difficult to roll out. Cut the rectangle into two long strips. Then cut each of those strips into about fourths, or so that you are able to create near squares. Take each square and place a tablespoon of cherry pie filling onto the center of the square. Fold the pastry over the top of the cherry pie filling. Use a fork to crimp the edges of the puff pastry together. Place the turnover onto a parchment lined baking sheet. Score the top of the pastry with a fork about 4 times. Finish forming the rest of the pastries and place them in the oven for about 15 minutes, or until golden brown. While the pastries are cooking, whisk together the icing. Whisk together the powdered sugar, milk, and brown sugar in a small bowl. Once the pastries have cooled slightly, drizzle the icing over the top of the pastries. Serve while still warm, or freeze and reheat when ready to eat!